The heart of the Vitria IoT Analytics Platform is the Unified Analytics Engine and its complementary components. 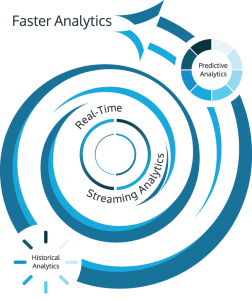 The Unified Analytics Engine delivers faster analytics in real-time with a unique methodology that integrates the analytics value chain across streaming, historical, predictive and prescriptive analytics with relevant contextual and situational data. This “pan-temporal” capability blends analytics across time frames in real-time. This is not found in any other IoT analytics platform or solution. For business operations specialists, this means that they have access to 360 degree context from which they can get the fastest and best possible basis. This in turn leads to smarter actions in real-time that improve business outcomes. The Unified Analytics Engine goes further than competing alternatives by offering the potential over time for prescriptive analytics which can recommend specific actions to accomplish certain outcomes. The Prescriptive Analytics in the Engine is integrated with an Intelligent Actions capability that enables the crucial ability for workflow logic, alerts, and notifications to enhance the ability of business operations leaders to take smarter actions in real-time. The Command Center in the platform and IoT applications can then leverage this capability to visualize analytics scenarios and provide dashboards to streamline review and action. As shown in the figure above, by unifying ingestion of all types of analytics, real-time contextual awareness, situational awareness, and the facilitation of intelligent actions, Vitria’s Unified Analytics engine enables organizations to maximum the value of IoT. Faster analytics in real-time combined with Intelligent Actions empower Business Operations Managers to meet the dramatically reduced time for action required for to meet the challenges of demanding IoT scenarios.